Beyond the Ordinary, the Common and the Old! Esquire Homes began its roots as a custom home builder and today is only bigger and better. With profound knowledge in both construction and design, Esquire can make your dream home just that! Each and every detail is attended to from initial conception to final completion. Our team includes architects, builders and interior designers, nothing is left to chance. Nicholas Delli Benedetti, Esquire Homes Custom and Construction Manager. His knowledge and passion for the construction industry is present in his everyday work. 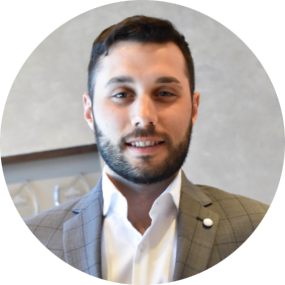 With an education in Construction Engineering and over 10 years of work experience, Nicholas brings passion and knowledge to Esquire Homes Custom Home Division. Having learned the industry from a young age, he is well versed in all stages of home building. He is meticulous and works closely with clients to ensure their dream home comes to life, building homes with great detail and quality. When Nicholas is not hard at work at Esquire Homes, you can be sure to find him north of the city enjoying our province’s beautiful outdoors.